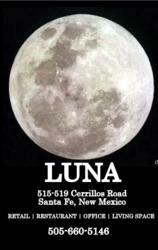 The projected construction start date for Luna, a new, mixed-use, walk-able community in Santa Fe, is March of 2012. 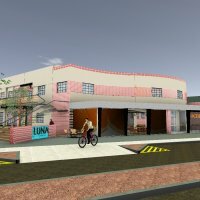 Luna, located at the gateway to downtown Santa Fe just north of the intersection of city traffic arteries Paseo De Peralta and Cerrillos at 519 and 519 Cerrillos Rd., has commitments for a gourmet international market, a coffee shop, a bike rental shop and other businesses. Santa Fe’s downtown gateway has a new addition with Luna, a green mixed-use development. A fixture on Santa Fe visitor guide SantaFe.com, Luna, located in the downtown area on old Route 66, has designs on starting construction in March of 2012 with a projection completion date of September 2012 for the first phase of the project. The $18 million project is available for leasing now with a target occupancy date of the fall of 2012. 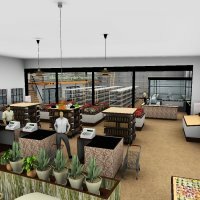 The initial phase will renovate or “recycle” two existing buildings on the property that were formerly a 1930’s movie theatre, a DeSoto car dealership and, more recently, a stationery store and night spot Club Luna back in the 1990’s. The development plan calls for 60,000 plus square feet of restaurant, retail, office and loft spaces. The development will include several green elements, such as highly efficient heating and cooling systems, extensive water catchment and reuse and even infrastructure planned for owners to easily install solar panels. Don Wiviott, a consultant for the project states, “We even talked about making the energy consuming components of the project metered to increase awareness among our community members.” Luna is named after Club Luna, the downtown nightclub that closed in 1994.